SILENCE THE LIES! ROCK THE TRUTH II! LOS ANGELES, CA  Complementing this years diverse array of Armenian Genocide commemoration activities will be the second annual Silence the Lies! Rock the Truth! concert. Organized by a coalition of community groups and artists, including the Western Regions of the Armenian Youth Federation and the Armenian National Committee, this social justice concert will be dedicated to raising awareness of the Armenian Genocide through music and activism. The groundbreaking concert, now in its second year will be held at the El Rey Theatre in the heart of Los Angeles on Saturday, April 24, 2010. In 2009, the first annual Silence the Lies Rock the Truth concert played to a sold out audience with performances by Viza, Sebu, the Cause, HomeMadeDevices and Echocell and was featured in the Los Angeles Times. With a lineup featuring Viza and Element and other guest artists such as the Dirty Diamond and Rapper R-Mean, this years concert promises to send a powerful message to rock the truth on the Armenian Genocide. As the 95th Annual Commemoration of the Armenian Genocide approaches on April 24, 2010, Armenians and human rights activists from across the globe are preparing to honor the 1.5 million souls that were victims of this crime against humanity. This particular year, especially with the passing of House Resolution 252 in the Foreign Affairs committee of the United States House of Representatives, commemoration events honoring the genocide will be extraordinarily poignant. “We look forward to what will be a memorable evening of commemoration through artistic expression, stated ANCA-WR Government Relations Director Lerna Shirinian. Working with socially conscious artists helps to advance the Armenian Cause with not only Armenian Americans but within the broader human rights community and media spheres throughout the region, she added. The ANCA-WR and AYF-WR will be joined by the AGBU, Serjical Strike Records, Alpha Gamma Alpha Sorority and Knoup Presents in co-hosting the event. Concert organizers will donate proceeds of the concert to two very important organizations. The Armenian Relief Societys Armenia-Artsakh Orphan Project and the Birds Nest Orphanage in Lebanon both provide vital support and assistance to needy Armenian children abroad. The artists and co-hosting parties would like to encourage everyone in the community to participate in this event to not only commemorate the martyrs of 1915 but to also benefit the Armenian orphans. More information can be found at: www.silencethelies.com to learn more about the Armenian Genocide, take action in the United States Congress, and help support involved charities. Tickets are also available for advanced purchase on the website. 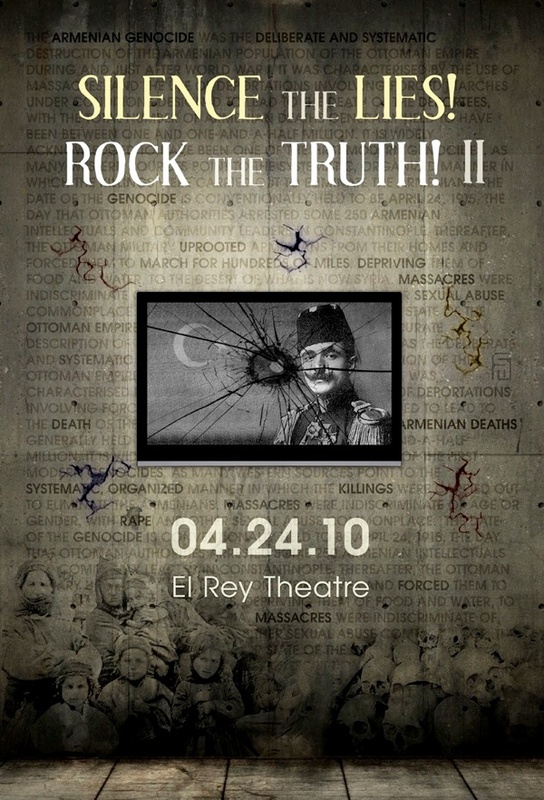 Silence the Lies Rock the Truth is an annual social justice concert dedicated to exposing denial of the Armenian Genocide and raising awareness of this horrible crime against humanity. As a part of its benevolent mission, concert organizers annually donate proceeds of the concert to worthy charities such as the Oran Charity in Armenia and the Armenian Relief Society.